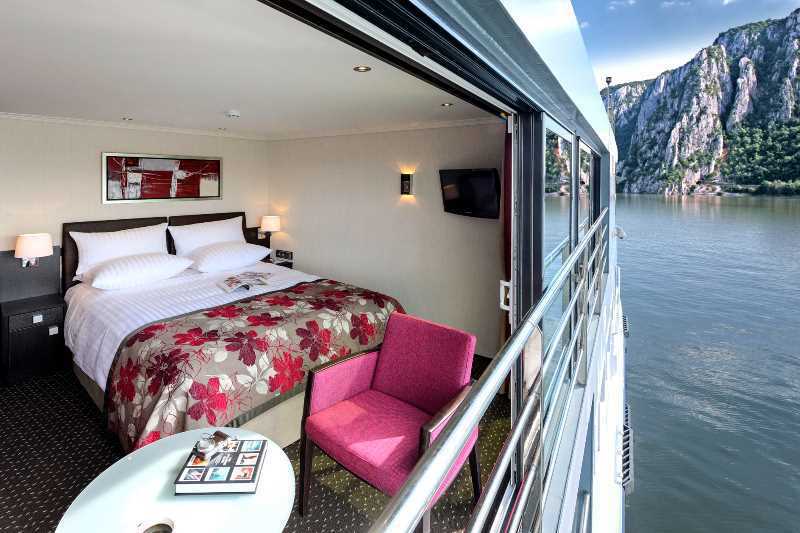 River cruising is the fastest growing segment of the cruise industry, with many new ships being built each year. Popular destinations such as Western Europe, Russia (Volga River), China, Egypt are now joined with the emerging Eastern European nations such as Hungary, Romania, Slovakia and more. You are almost continually in sight of land and have constantly changing scenery. Since rivers were the early means of commerce, cities and towns built up around them. Therefore ships often dock in the heart of town. This allows you to step right off the ship and immerse yourself in the local atmosphere, without a lengthy process to get off the ship and travel to shore. River cruise ships are narrow because they have to go through locks along the way. Most cabins are outside cabins with windows, French balconies or standard open-air balconies. They hold far fewer passengers (usually 150-300 people) than ocean-going cruise ships and provide a more intimate experience. Often, locals come on board to entertain at the stops along the way. Also special highlights may include free shore excursions, sampling the local cuisine with cooking demonstrations, wine tastings, and lectures on the area at no extra charge. Most cruise lines include personal headsets with their shore excursions. And some occasionally include dinners at local restaurants rather than on the ship. However, we might point out that the food on board tends to be outstanding. As you can tell, there is more emphasis on the sites you visit rather than the ship itself and this appeals to those who want to sample the local lifestyle and culture of the places they visit. River cruises are close to all-inclusive, so there is little extra cost to you. Shore excursions with English-speaking guides are included, wine and beer with dinner (and sometimes lunch as well), gratuities and more, depending upon the cruise line. This can really help when you are trying to figure out what the total cost will be for your vacation. Some older ships do not have elevators, so you would need to be able to climb stairs. Many of the newer ships now do have elevators so if you have mobility problems be sure to check ahead to see about the cruise ship you plan to book. Even if you may have mobility problems, we encourage you to consider a river cruise. Click here for our suggestions for people with physical limitations. Most river cruises do not have a priest on board, but certainly there will be opportunities in some of the ports to attend a local Mass, or think about chipping in and taking your priest along. Some river cruises that will have definitely have a priest on board are the ones shown below from Select International Tours . And you can get a $100 discount if you mention code CTguide when you register. Click here for details. River cruises offer the option to extend your stay either at the beginning or end of the cruise. Most European river cruises are from April through the end of October, but there are a few “Christmas Market” cruises in late November and early December. Most river cruise lines offer special low airfare and some even have free air. So be sure to shop around for the best deals. Also, you will find that some river cruise lines offer fairly low rates for single cabins if you are traveling solo. Most policies offered through the cruise line tend to be more expensive and offer less coverage than travel insurance you buy directly from a travel insurance provider. You can find out more about insurance for cruises here to get the best deal.